There are many reasons that I started glamjulz… but I get the most satisfaction from helping women express themselves and feel beautiful in their own way. As you many of you know, from other charities and organizations that I work with, I love being able to give back and share my success with the people that really need it. Being inspired by positive female role models, I came up with the idea to not only celebrate women, but also to help them… this is why I have decided to help an organization called, Dress for Success. For every one of our 2018 Limited Edition glamjulz Colours of A Woman Bracelet that you purchase, I will donate a piece of glamjulz to Dress for Success Toronto. This bracelet is inspired by our spring collection highlighting all of the characteristics of a woman. 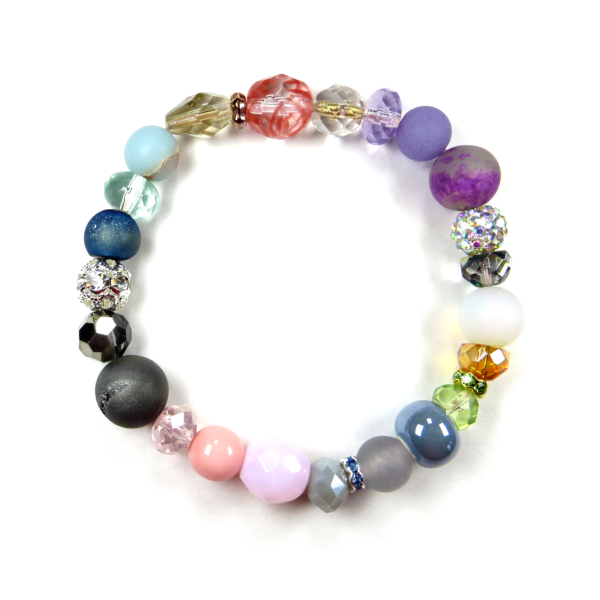 We have taken each of the colours of the collection and mixed them into one bracelet. This bracelet represents strength, vulnerability, endurance, compassion, nurturing, femininity, motivation and confidence. It will coordinate beautifully with any julz you might choose from our Spring Collection. Each donation to Dress for Success will vary from pieces such as Necklaces, Bracelets, Earrings and Rings in many different colours and styles, in hopes that each woman in the Dress for Success program will have plenty of glamjulz to chose from, and that every outfit will have the perfect piece of coordinating jewelry. Looking beautiful, feeling strong, and believing in yourself can open many doors… and THANK YOU for your help in opening the door to success for these deserving women.